Today we went to Hamleys! After some thought we decided on a random trip into London! We’ve never taken the kids on the underground before, and with so much planned this year it seemed like a good time to introduce them to it! Off to Morden we went to pick up the tube. Thomas and Jasmine asked a lot of questions, “Why is it dark in the tunnel?”, “Where are the worms?”, “Why is it bumpy?”, “Is this our stop?” (asked at every station!). Ben sat quietly, very unsure. I don’t think it was what he’d had in mind when we said we were going on an underground train! We got off at Oxford Circus and our first stop was lunch. 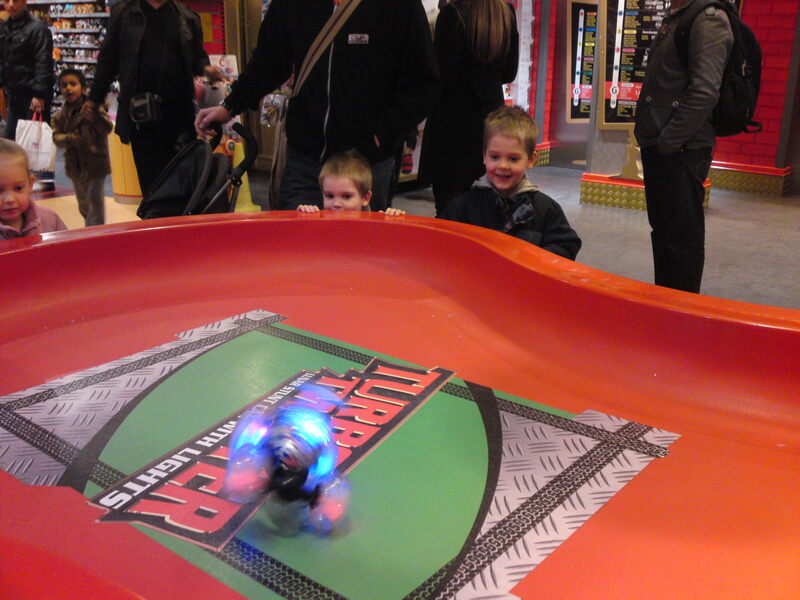 Then we set of down Regents Street for Hamleys. I’d post a picture of their new things but they’ve all taken them upstairs to bed with them, so this is about the only good photo I got all day (I’m not great at photographing using my phone.) The blurry thing you see is the Stunt Car being driven, very fast, by Thomas.